The line of testosterone-based hormonal drugs (propionate, enanthate, cypionate) is presented in the form of its compounds with fatty acids – esters. 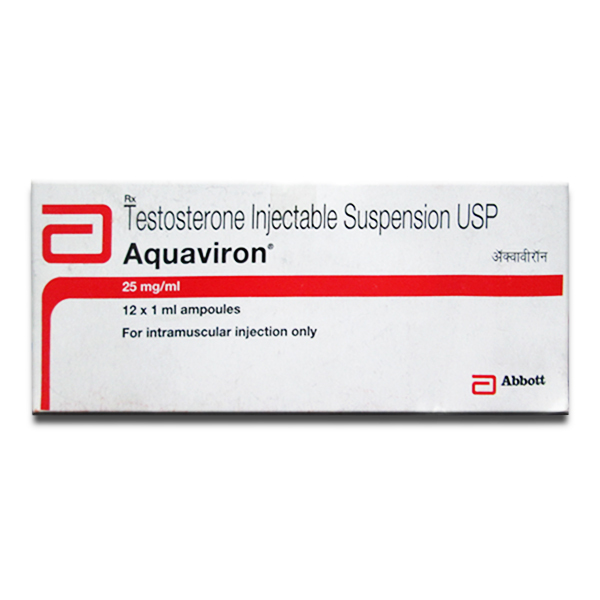 The only exception is testosterone suspension (Aquaviron) – the “patriarch” of sports pharmacology. It was developed back in the 30s of the last century. Aquaviron is a suspension of dry hormone in water. In its composition there is nothing but testosterone itself. The drug is used at the final stage of training or on the eve of the competition itself. Also, the suspension will be the best solution for athletes who need a fast powerful anabolic effect. This variant of the steroid has a very short half-life – 60-100 minutes from the moment the hormone enters the blood. This has both positive and negative qualities. The main positive quality concerns athletes undergoing doping control. With proper calculation of the period of action of the steroid, it is almost impossible to get caught in control. The body is very active in responding to this drug. The athlete feels the effect of the hormone from the first to the last minute. In this aspect, the suspension is ahead of even testosterone propionate. With a short half-life, the risk of symptoms of virilism is reduced by an order of magnitude. In other words, in comparison with testosterone enanthate, the risk of prostate adenoma is much lower. Not a single drug from the testosterone-based steroid community can be compared with suspension in terms of effectiveness. The speed and efficiency of increase in volume, strength and regenerative functions – the suspension takes the first place. A short half-life period means a peak surge and a rapid decline in hormone activity. With a solo course of testosterone suspension, injections will have to be done daily. Injections of aqueous solutions are much more painful than oil. With this frequency of injections, there is a threat of sepsis. The level of aromatization of the suspension is very high. For athletes with a predisposition for gynecomastia and water retention, a course of suspension will bring many side effects. A high concentration of testosterone in the blood is maintained for two days, so injections are made daily. The optimal daily dosage is 50-100 mg. For the prevention of local irritation and sepsis, it is advisable to make injections in different places. The recommended duration of a solo course of a testosterone suspension is 4–5 weeks.